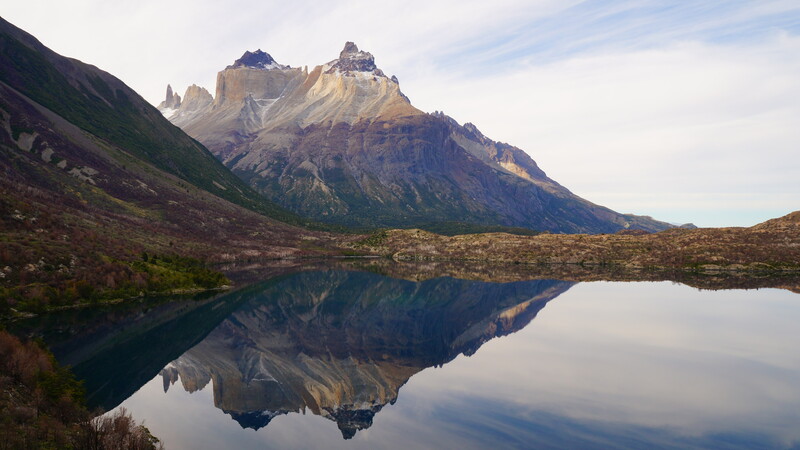 Visitors from all walks of life converge on the small hamlet of Puerto Natales to visit Chile’s and perhaps the Continent’s number one national park – Torres del Paine. 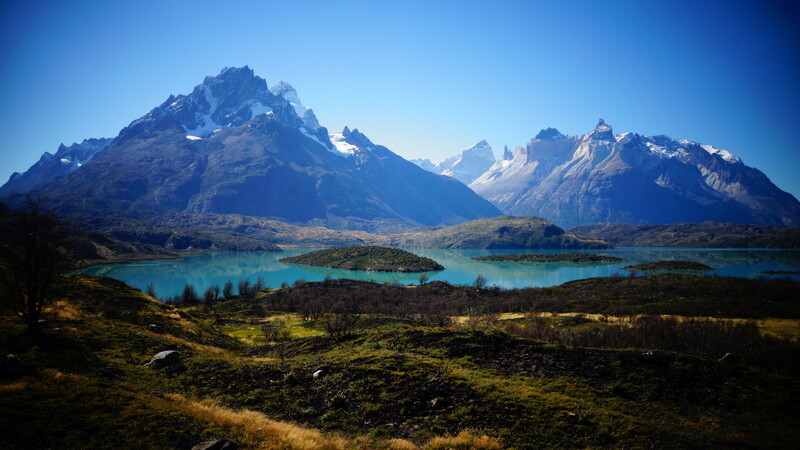 Located in the Southern Patagonian ice fields at the end of the Andes, the park offers diverse wildlife and incredible mountain scenery, glaciers, lakes, rivers and magellanic forest. 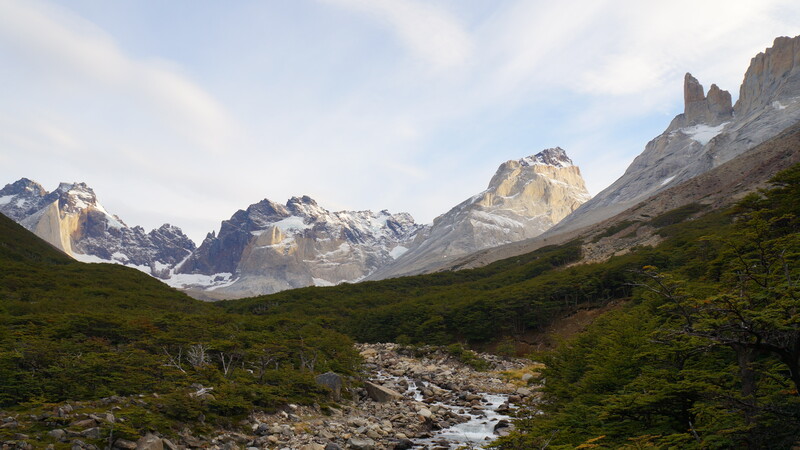 The park which, has been declared a UNESCO Biosphere Reserve, is over 180,000 hectares in size and is considered to be one of the best trekking Mecca’s in the world. 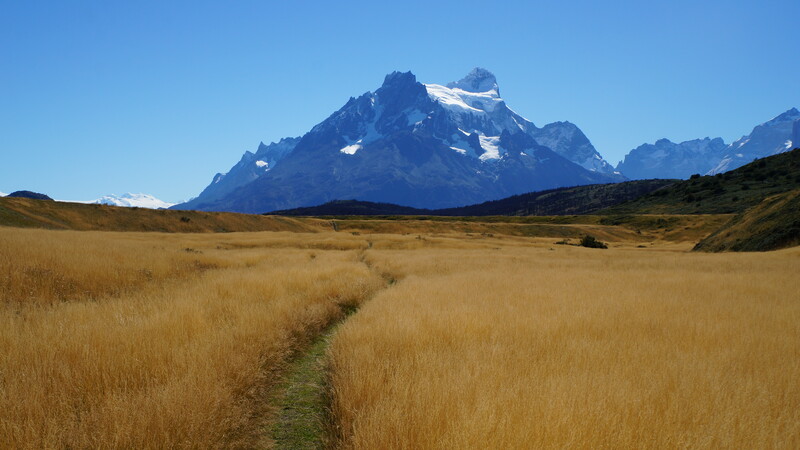 Many readers unaccustomed to holidays walking for days through wilderness carrying needlessly heavy packs, may smirk and think that the park is aptly named ‘Paine’, but what the park promises and delivers on is ridiculously beautiful vistas, wide open spaces, fresh mountain air, interesting wildlife and the challenge of a lifetime. 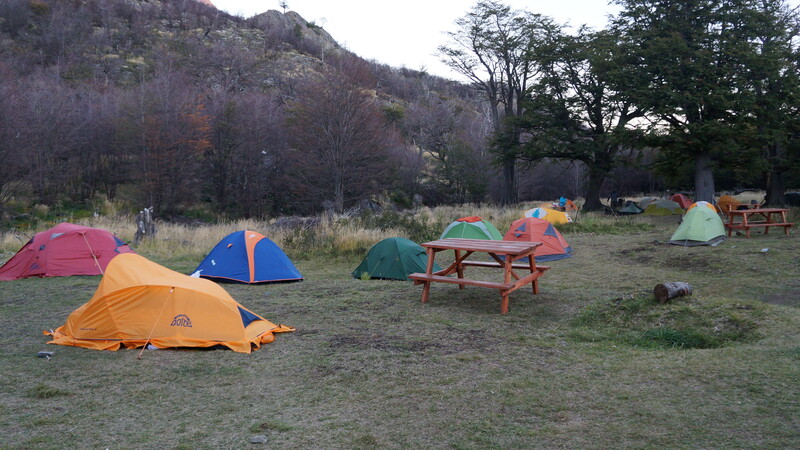 Where else could we wake up next to a glacier, drink water straight from the rivers, watch the sunrise turn towers of rock flaming red and see guanacos and pumas in their natural environment. 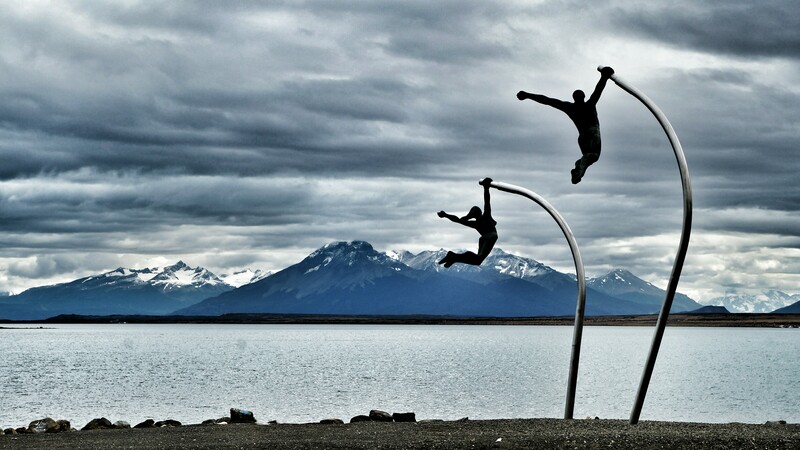 We were picked up by coach from Puerto Natales at 7.50am and driven two hours down a gravel road to the park. We were smiling to ourselves as the weather was great without a single cloud in the sky and the rising sun gave us a warm glow. 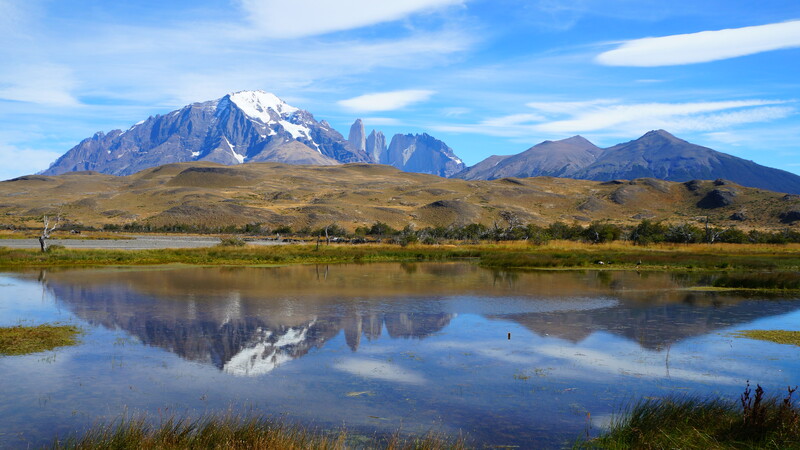 As we drove closer to the park we saw our first glimpses of the Paine massif rising dramatically over the Patagonian steppe. 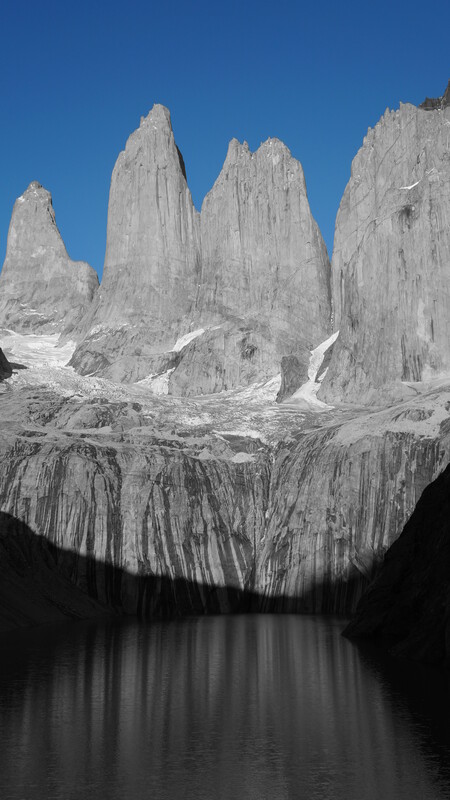 The jagged mountains rose to over 3000 metres and the black and grey granite spires were in stark contrast to the pure white snow at the peaks and the deep blue sky above. The rolling hills surrounding the park were a blanket of colours – sage green, peppercorn brown and cinnamon and the large lakes were beautiful azure and startling turquoise colours. 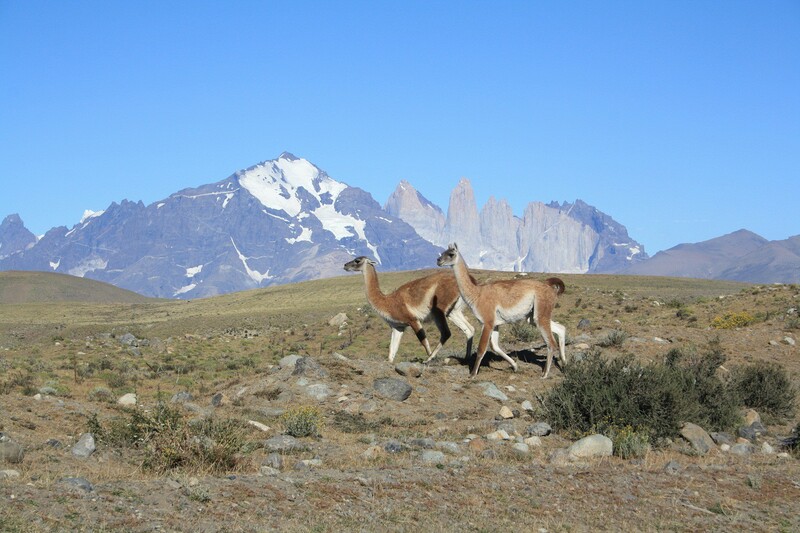 The guanacos, which were golden brown with a flash of white on their tummies, stood by the roadside like statues just watching our bus inquisitively. There are many different trails throughout the park but the most popular are the ‘Circuit’ taking 7 to 10 days and the ‘W’ taking 4 to 6 days. We decided to spend 5 days walking the ‘W’ from left to right. The trail is so called as the route makes a ‘W’ shape (as pictured below). The ‘W’ can be completed in either direction and takes in some of the most classic views the park has to offer. 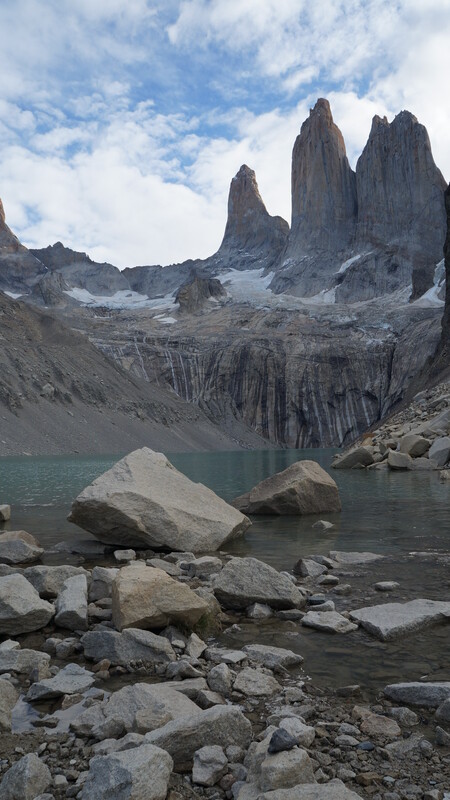 After paying a hefty entrance fee to the park (18,000 Chilean Pesos which is equivalent to nearly 40 USD per person) we decided not to pay a further 30 USD for the one way 30 minute catamaran short cut from Puderto across Lago Pehoe and so we hiked in from Administration. 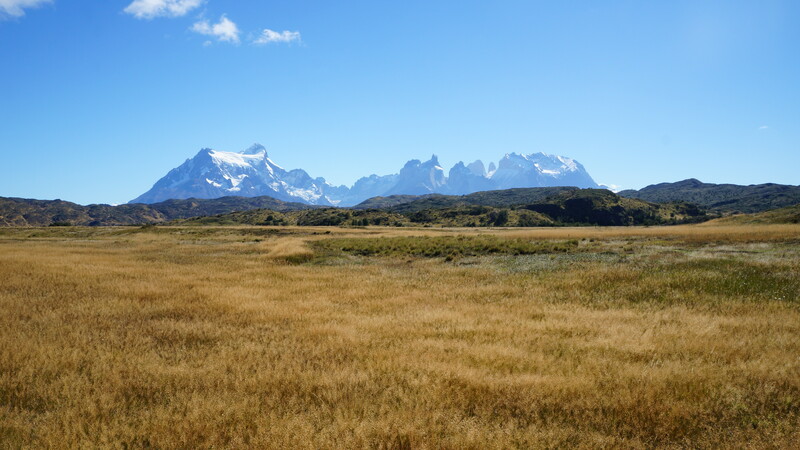 The long 18km hike was across flat, grassy terrain and even though there were some good views along the way, the majority of the walk was tiring and relentless. After fours hours of walking with bulging packs full with clothes, five days worth of food supplies, cooking equipment, sleeping bags, roll mats and a three person tent, we were beginning to wish we hadn’t been so tight-fisted and just paid for the catamaran! 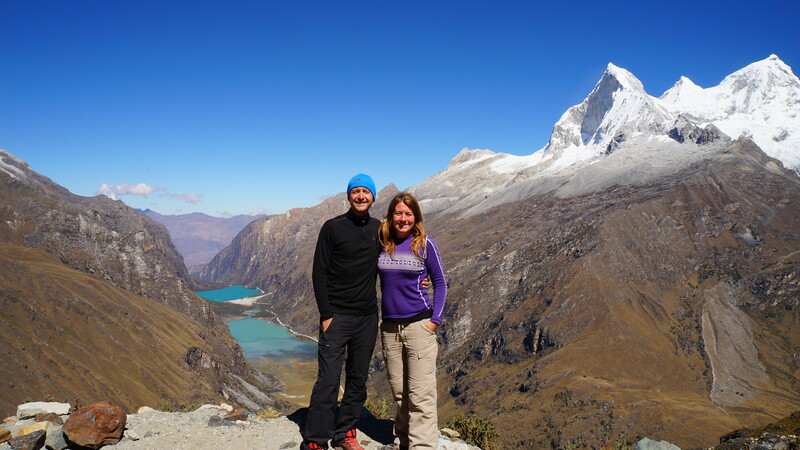 Our grumbles were shortlived and we were rewarded with simply glorious views of Los Cuernos from Mirador Pehoe giving our tired legs a new lease of life. 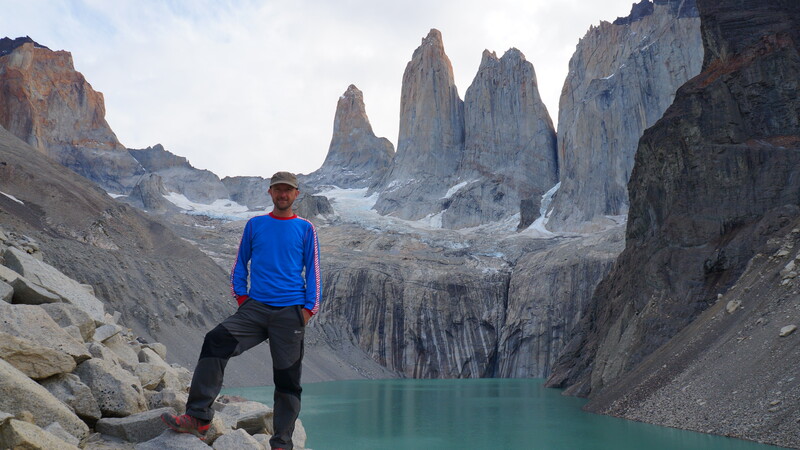 From Refugio Grande Paine, we still had a further 11km to walk (which took us 3 hours) to reach Lago Grey where we would spend the night. After a short rest on a grassy spot in the sunshine accompanied by some food and water, we continued on. The climb became steeper, with some larger rocks to clamber over, however the well trodden route meant that the path was smooth and easy to follow. 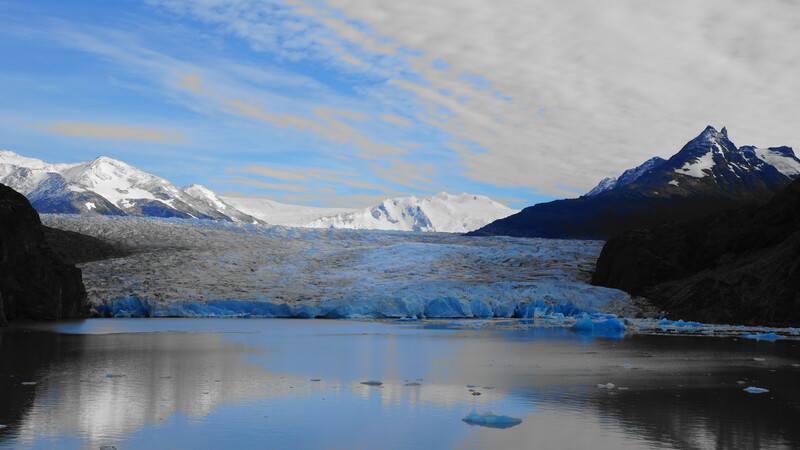 Our first distant views of Glacier Grey put into perspective its sheer size and natural beauty. Glacier Grey is 6km wide and 30 metres high and this mass of ice is one of 49 glaciers which breaks down Compas de Hielo Sur which is the third largest reserve of fresh water in the world, just behind South Antarctica and Greenland. On the glacier the temperature always remains below zero but as we stood and admired the glacier in the warm sunshine it glistened, stretching back further than our eyes could see. 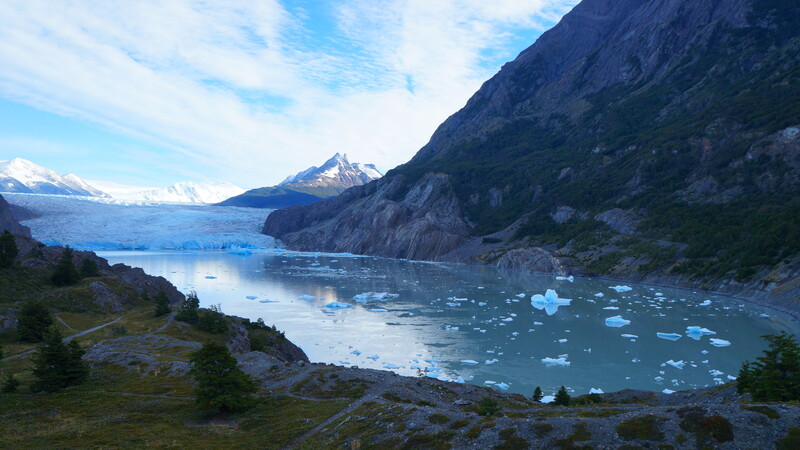 A small sightseeing boat in the lagoon was dwarfed by bobbing glaciers that looked like sculptures in a gallery. 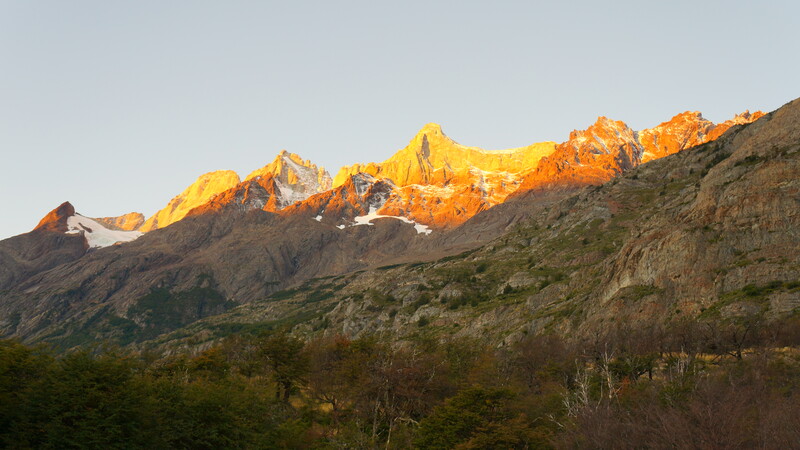 We felt shattered when we finally dragged ourselves into Refugio and Camping Lago Grey at 7.40pm with the setting sun bathing the rugged mountains in a golden glow. The campsite was reminiscent of a music festival – the small field contained around thirty other tents of all shapes, colours and sizes and we sandwiched our canvas home somewhere in the middle on the last flat spot we could find. 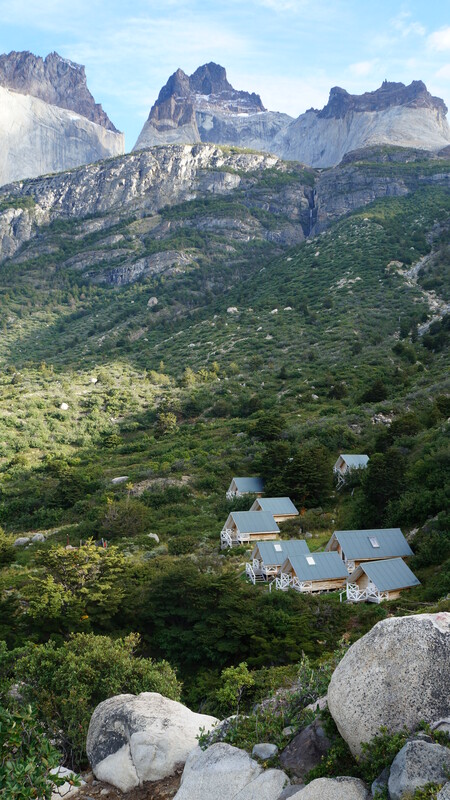 The Refugio, in contrast to the camping, was designed in a mountain chalet style, complete with a bar that wouldn’t have looked out-of-place in the ski resorts of Zermatt or Verbier, although the guests do pay a small fortune for the privilege of sleeping indoors. 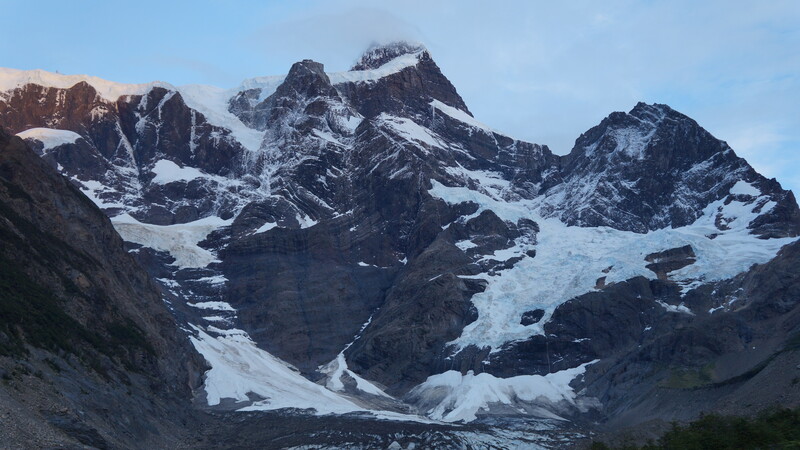 The viewing point for Glacier Grey was just ten minutes walk from where we camped. Wispy clouds filled the sunless sky that morning and there was a chill in the air so we layered on clothes and followed a small path from camp to the viewing point. Glacier Grey was magnificent – still, serene and brooding. The layers of thick ice had ribbons of grey ash running through them – presenting us with a geological time line of eruptions that happened millions of years ago. 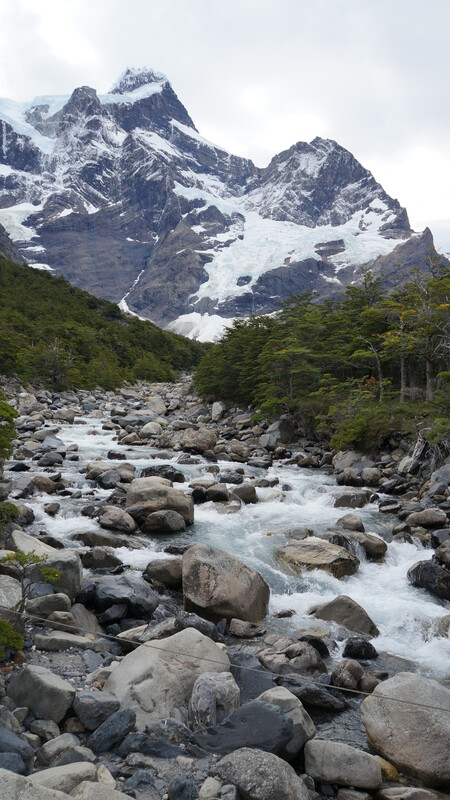 As we moved closer we could hear the glacier groaning and cracking – almost like a distant storm approaching. Large icebergs carved only hours or days earlier, floated in the glacial lagoon in front of us. We clambered across rocks to get a closer view and to get that uninterrupted photograph across the water. It really was a breathtaking sight. The next part of the day took us back the same route as the afternoon before. The trail this time seemed a little bit easier as it was mainly downhill and we watched condors soar around the peaks above our heads. 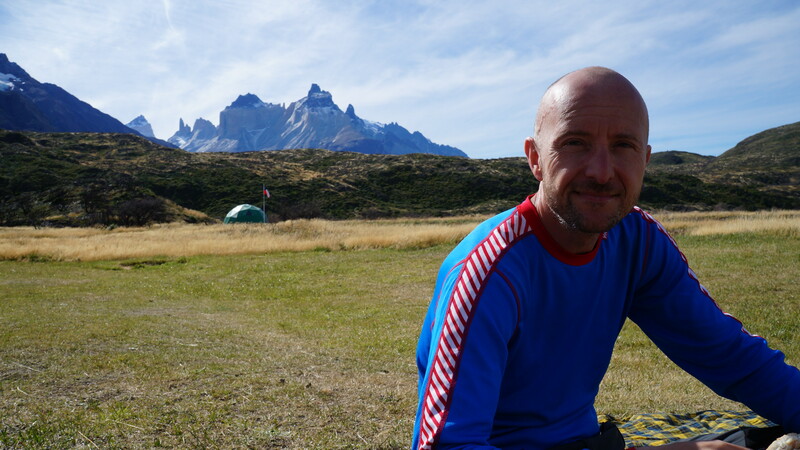 We arrived at Refugio Grande Paine in 2.5 hours and found a patch of grass with our names on it. 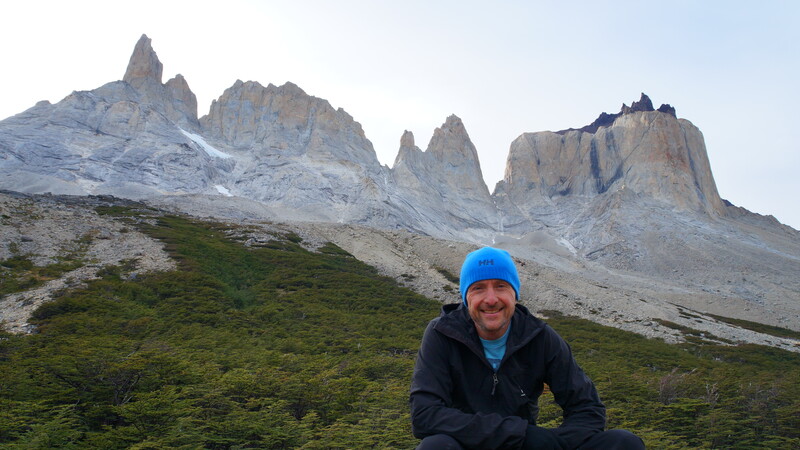 The sun had come out so we relaxed for an hour eating lunch with Los Cuernos over our shoulders reminding us of the challenges still to come. We took our shoes and socks off and enjoyed feeling the breeze between our toes as we stretched out in the sun’s warmth. It is possible to buy basic but expensive supplies from the Refugios so we indulged in a can of fizzy drink to share between us for a sugar fix. Each sip was like nectar from the Gods! 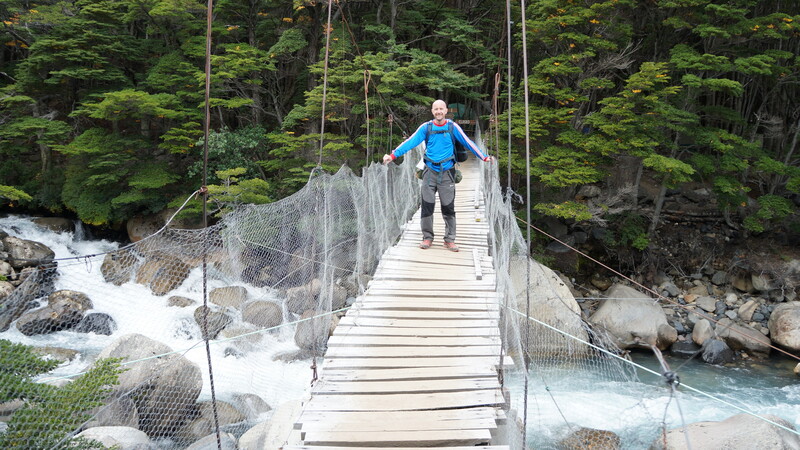 It took us 2.5 hours to walk the next section of the trail along a relatively easy, undulating path, through beech forest and across hanging rope bridges. Small waterfalls cascaded down from the mountains and our view of Los Cuernos in front of us was mesmerising. Our packs felt even heavier than the previous day and our shoulders were burning by this point. Our new home for the evening was Camp Italiano, a free site with only basic facilities (long drop toilets and a small covered cooking area). 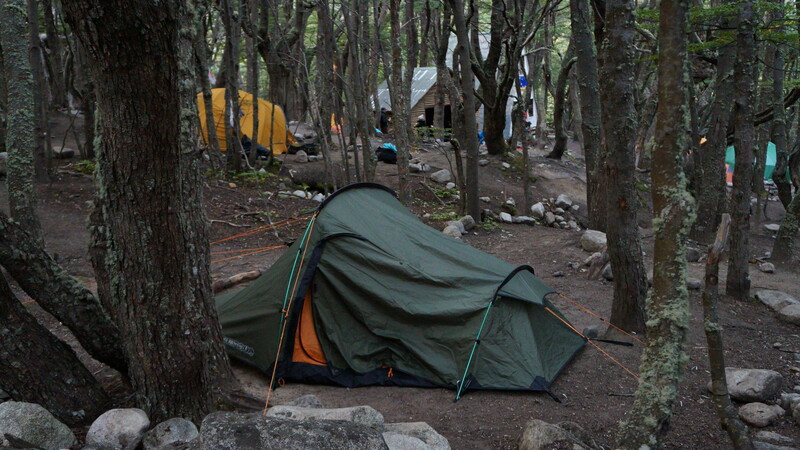 Many trekkers were busy setting up their tents in the forest when we arrived and we looked for a flat spot. We pitched our tent next to a thundering river flowing down from the mountain and we laughed saying that at least the noise from the river would drown out the snoring and farting of our fellow campers although we later agreed that it’s the inside of our own tent that we should really be worried about! We cooked pasta (again) with tomato sauce and strips of roast chicken brought with us from Puerto Natales. We tried really hard to ration our biscuits that evening but they tasted so good (chocolate orange flavour – mmm!) after a long, hard day that we ate three-quarters of the packet in one go. It was only 8.40pm when we climbed into our sleeping bags so we read our books for a little while but soon put the light out with another busy day to come. On the third day we left our tent and packs behind and hiked just with day bags into Valle del Frances, the middle section of the ‘W’. We made an early 8am start as the climb to the look out point and back would take 5 hours and then we still had a 2 hour walk onto the next camp. 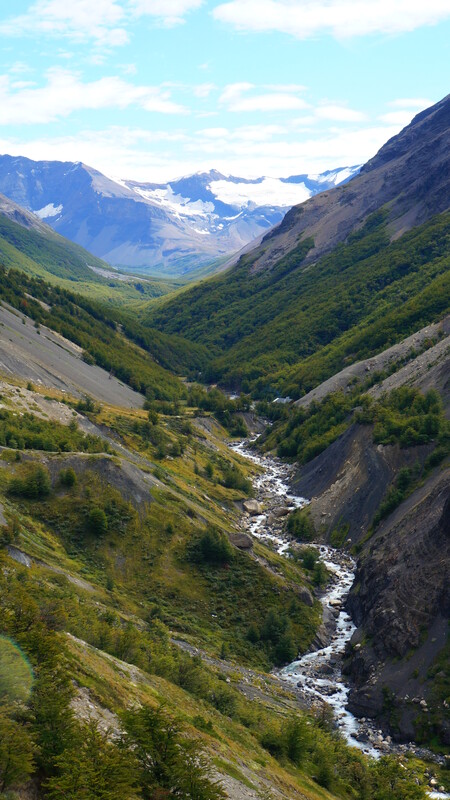 As we passed Glacier del Frances, at the start of the valley, we could hear what sounded like dynamite detonations from deep within the rock. Every now and again, fresh powder snow was shaken down from the peaks, like mini avalanches and the snow met with small rivers flowing out from underneath the immense glacier. 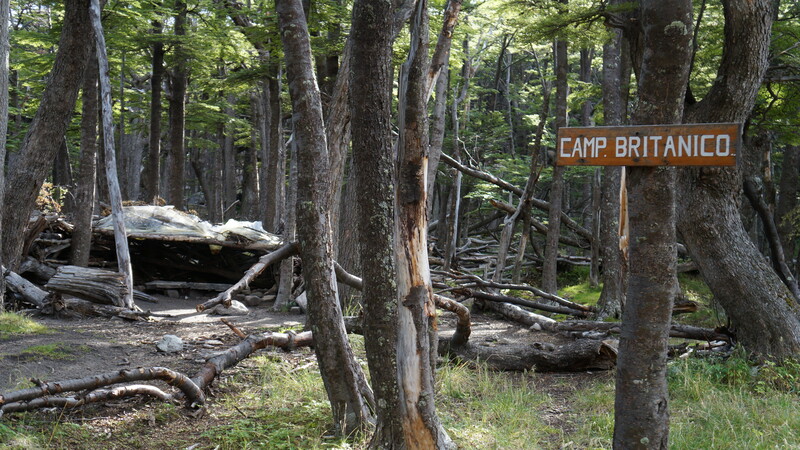 The climb was initially steep over smooth boulders but flattened out through tall trees and across small streams. It felt fabulous without our heavy packs and we almost skipped along the trail. The last 20 minutes, to the lookout point just past Camamento Britanico, was steep once again and we huffed and puffed to reach the viewing area. 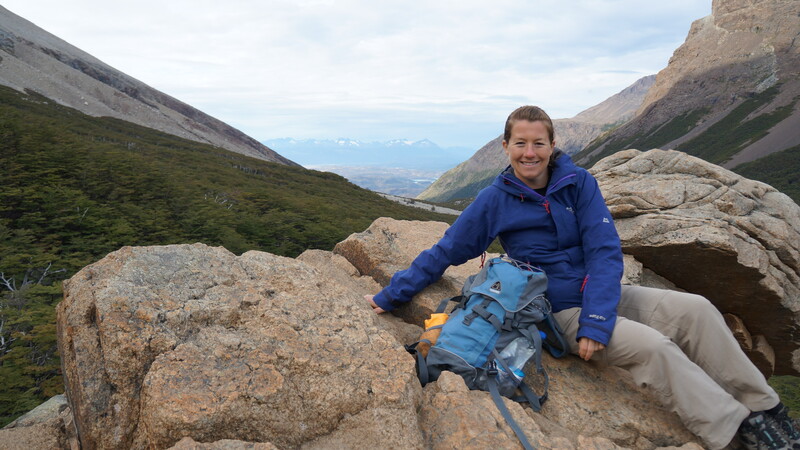 Once at the summit, we clambered onto the top of stacks of stone and we were presented with a 360 degree view of the mountains and rock formations all around us. The mountains had multiple layers with subtle colours from seal grey to salmon pink. 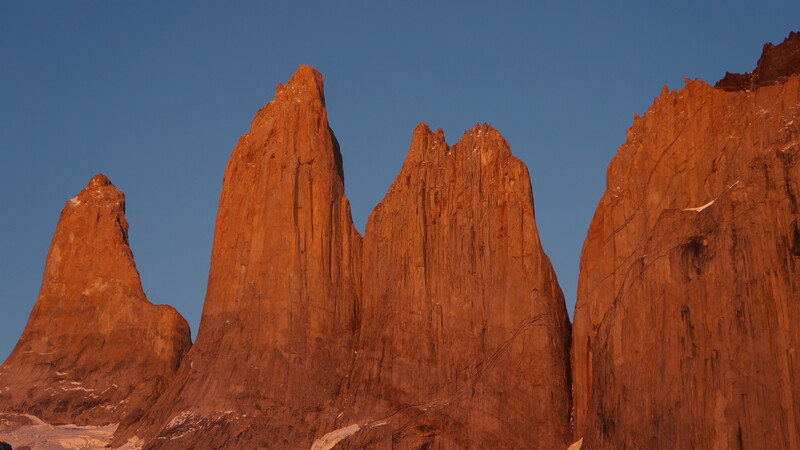 We imagined that millions of years ago, thunderbolts hit the mountains and carved out these huge pillars of rock – perfectly smooth and straight down one side with irregular, serrated tips. In reality, years of water and wind erosion has carved these incredible formations from the soft rock. We retraced our steps back to camp, this time with views of the valley leading down to the lagoon and distant snow-capped peaks. 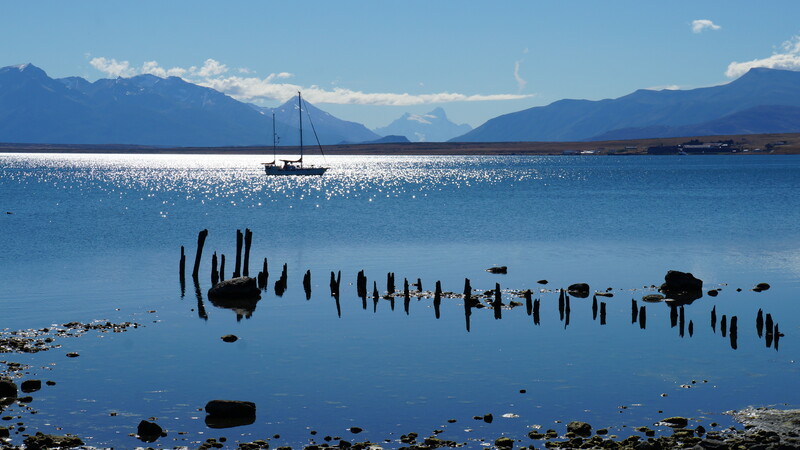 Once back at base, we relaxed for a while, ate cheese rolls and delicious dried mango and papaya we had brought with us from Puerto Natales, packed up our gear and hit the trail once again. Our legs were feeling pretty tired from the Valle del Frances hike but it was another fine and sunny day so we pushed on at a steady pace. The views along the lake were fabulous. 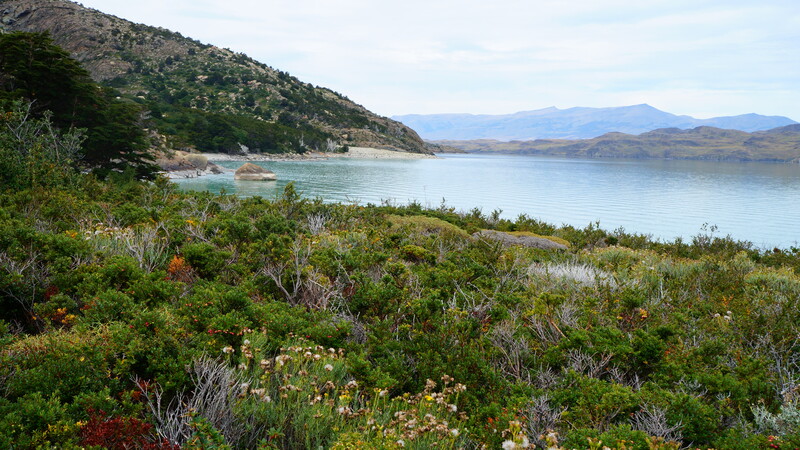 We were approaching mid-March so with Autumn on the way, we noticed the shrubs and foliage along the shoreline were starting to change from green to shades of red, orange and yellow. A lot of the route was thankfully downhill and we stopped for a well needed rest at a beautiful pebble beach. 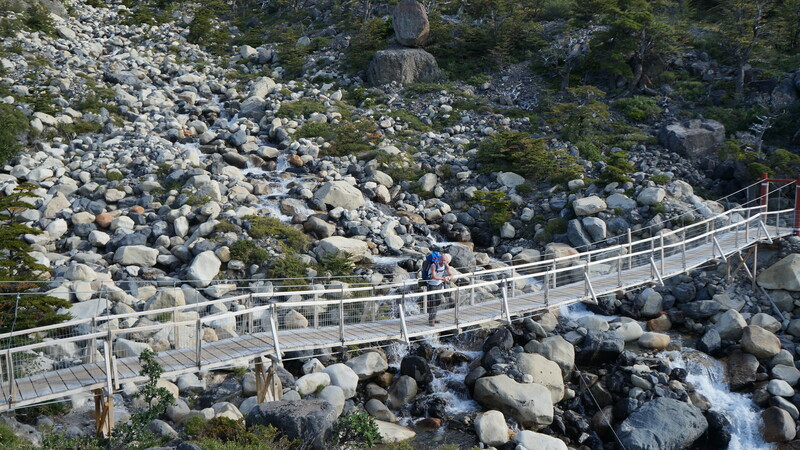 We made it to Refugio & Camping Los Cuernos in around 2 hours where we pitched our tent on raised wooden platforms where we needed to be inventive with large rocks to hold the tent in place instead of tent pegs. We took our one and only shower in the park at Los Cuernos and even though the facilities were very basic, the water was boiling hot and it made us feel vaguely human again. Los Cuernos had a nice lounge area where guests at the Refugio and campers could mingle, warm up in front of the wood burning stove, eat and drink. During the evening we looked longingly at the bar and the alcoholic drinks listed on the chalk board but we couldn’t quite bring ourselves to part with 5000 Chilean pesos (nearly 11 USD) for two small cans of beer when a can should cost around 500 Chilean pesos so we shared a fizzy drink which lasted about 3 seconds. After a gourmet dinner of rice and vegetables, we settled down for the night and slept well until we had a furry visitor who tried to chomp his way through the tent. With a few growls, hand clapping and feet stomping we managed to scare it away but not before it had bitten a tiny hole in the inner lining of the tent. If it had known that we only had rice and pasta in our food bag, it probably wouldn’t have bothered! This was our longest and hardest day, trekking mostly uphill for around 5.5 hours with the sun in our faces. However, the beautiful Autumnal colours and excellent views to distant mountains made it all very bearable. 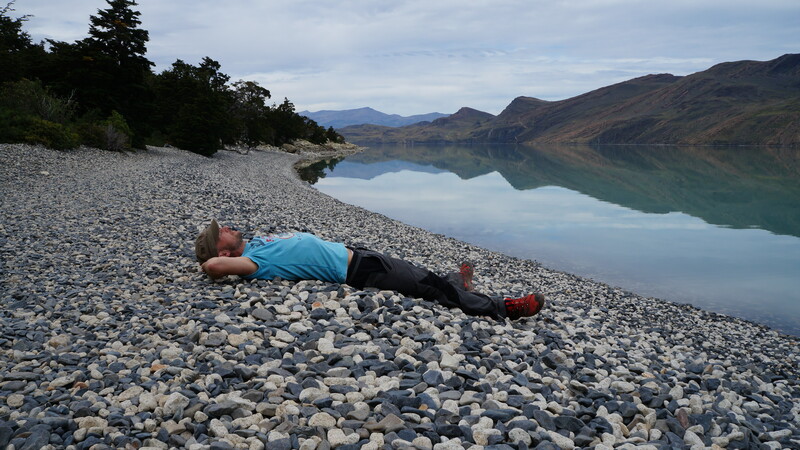 We made plenty of rest stops for water, nuts, fruit and shoulder relief and we were very taken with one breezy but glorious spot overlooking Lago Nordernskjold. 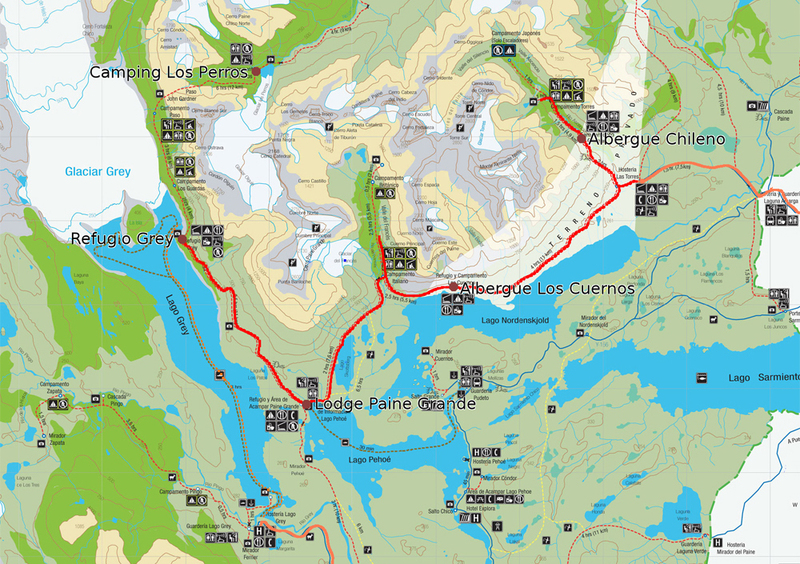 During one of our breaks we heard some of the other trekkers talking about a ‘secret route’ which could take several hours off the time it would take to reach Refugio & Camping Chileno and as there was no indication of this on the official map, we hoped that we wouldn’t walk straight past it. However, we had big grins on our faces when we reached that point, as a large wooden sign clearly pointed to the ‘secret route’! Not so secret after all! Almost halfway up the Ascensio Valley we reached a steep gorge leading up to Refugio Chileno. 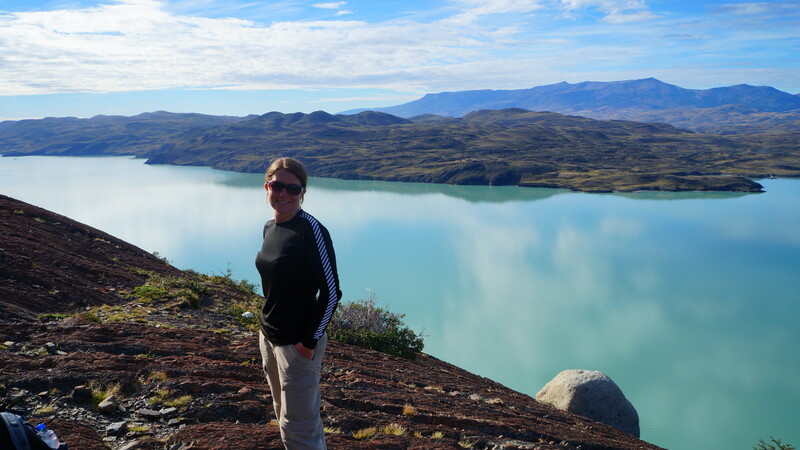 We climbed high up to a ridge with fabulous views and then back down to the river. The path seemed unnecessarily cruel at this point as the Torres were almost in sight but the path took us back down and around the mountain in the knowledge that we would need to climb to this height once again. Friendly faces on their way back down from visiting the Torres greeted us warmly and promised we didn’t have far left to go and after 5.5 hours of walking uphill, our legs feeling like jelly, we finally reached Campamento Torres. 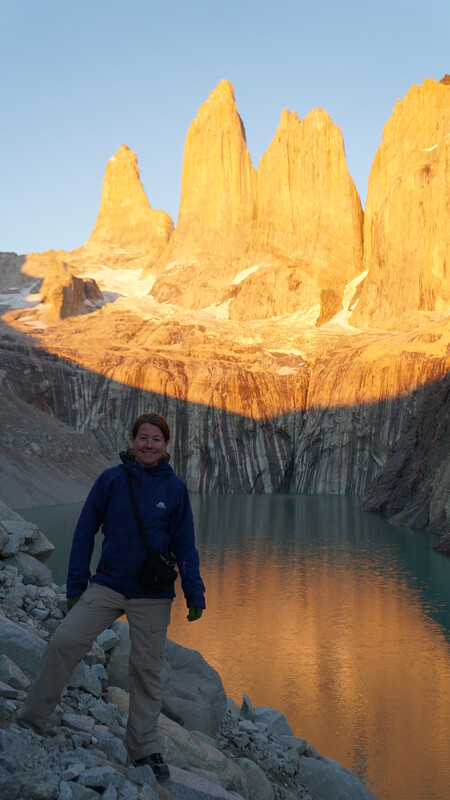 It was only 4.30pm and the sun was still shining bright so despite our exhaustion we decided to climb to see the Torres straight away. The 45 minute climb was very steep and our legs burned and threatened to buckle underneath us but as we reached the top we both took a sharp intake of breath and looked on in amazement. 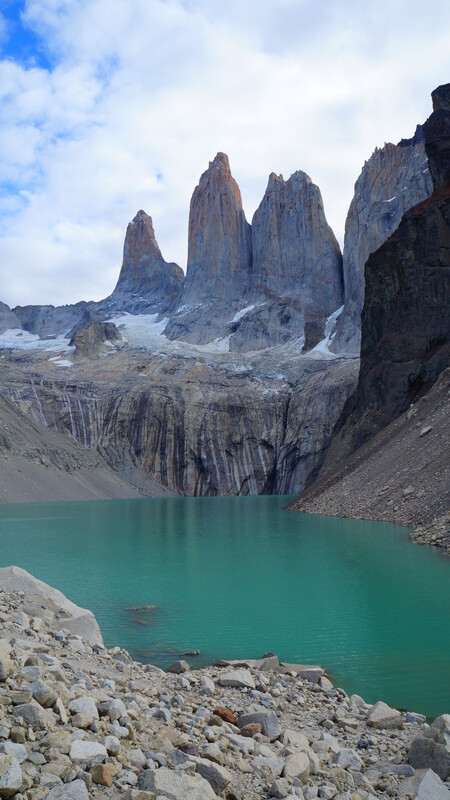 Standing within a basin of mountains, boulders and scree, the Torres, after which the park is named and its crowning glory, rose above an emerald-green lake. They had a subtle red pigment and were extremely rough and jagged at the top. A layer of compact snow and ice hugged the base of the Torres and below them a sheet of zebra patterned rock plunged into the icy waters. 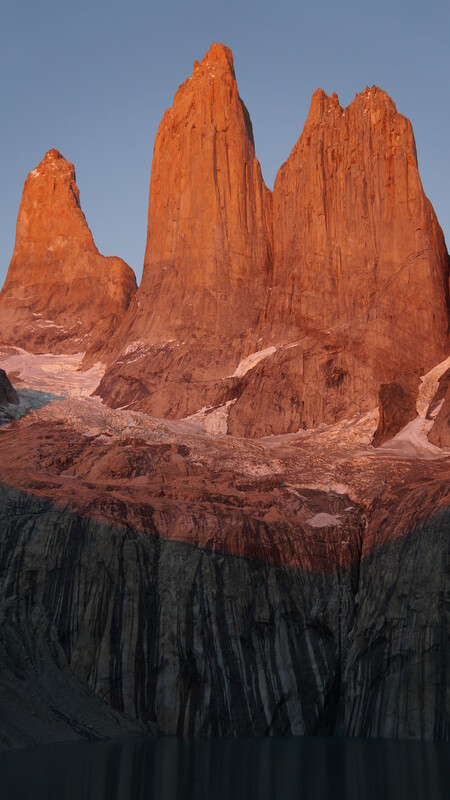 A fellow trekker told us that people often climb to see sunrise at the Torres as the angle the sun strikes the rock makes it glow bright red, but it’s not guaranteed to see them as thick clouds can completely obscure the view. As we looked around the sky which had been blue was starting to fill with clouds and we tried to predict the conditions for the following morning. That evening there seemed to be a real community spirit in the campsite as for many people doing the ‘W’ or the ‘Circuit’ this signified their last night of camping (as it did for us). People shared food outside of the cooking hut as they sat on large stones chatting idly and day-dreaming about the food they’d eat when they got back to civilisation. We ate pasta with a plain tomato sauce and tinned tuna and the most entertaining part of the meal was watching Dan fight to get the can open with his Swiss army knife. We had biscuits for dessert and we were in bed by 9.30pm. Dan decided that sleep was more important to him that morning than climbing to see the Torres again so it was an early start for (crazy) me as I wanted to see the ‘light show’. The alarm went off at 5.30am and it was pitch black and cold outside the tent. I had to fight the strong urge to pull my sleeping bag over my head and go back to sleep. I fumbled about with my torch trying not to wake Dan, throwing on clothes, rubbing the sleep out of my eyes and tying my hair back. I could hear other people starting to mill around in the campsite, speaking in hushed voices. I had decided to climb with as little as possible so I took only our camera and a bottle of water. 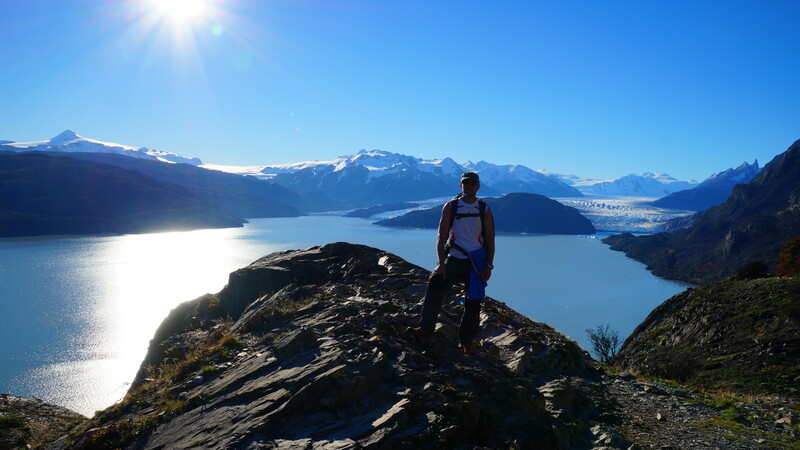 Within minutes of starting the steep climb, I was sweating and my jacket and fleece were tied around my waist. It felt really strange climbing in the dark with only my head torch to light the way and every step was slow and deliberate to steady myself and to ensure I took the correct path. A million bright stars shone from up above with no light pollution to dull their luminescence. A chain of torch lights stretched out up the mountain in front of me like little beacons showing the way. The climb took about 50 minutes and at times I got stuck behind a row of frustratingly slow climbers. Once at the top I clambered over boulders to higher ground where I could wait and watch. The air was cool so I pulled on my fleece and jacket once again. The sky behind us had started to glow orange with the breaking dawn and the Torres looked marble white against a deep indigo night’s sky. The patient observers could see the sky was completely cloud free and I held my breath excitedly for the spectacle that was about to unfold before me. 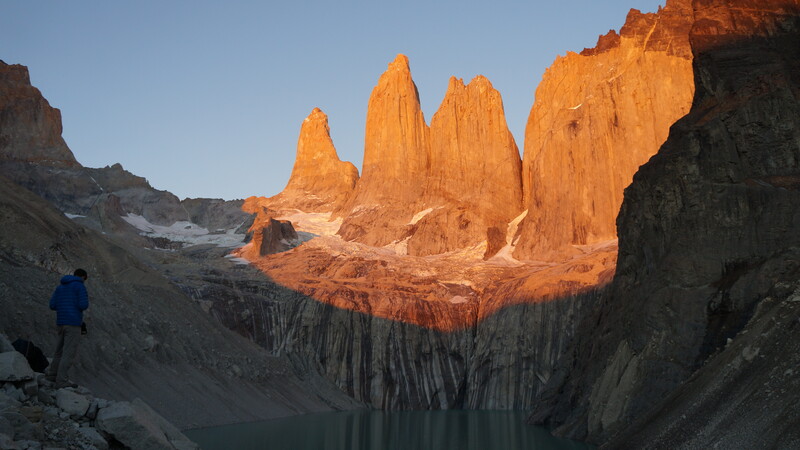 The light in front of us began to rise almost like a theatre performance was about to start and as the golden sun reached over the mountain behind us, the tips of the Torres began to glow an unearthly red. 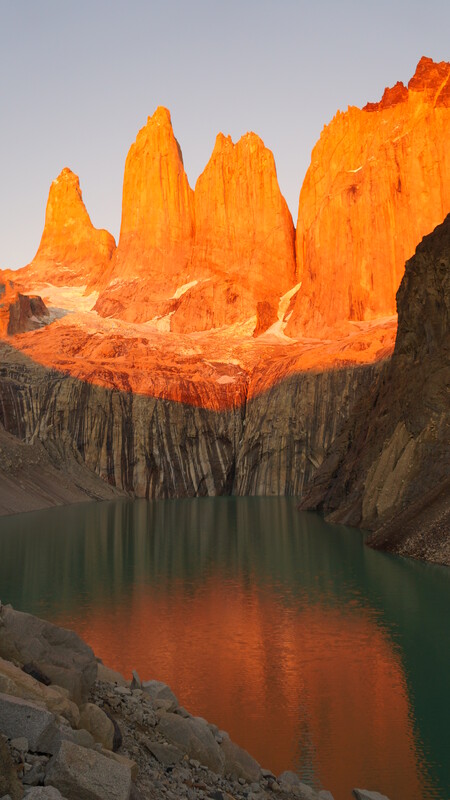 Like fresh ink soaking into parchment paper, the rising sun continued to cast a stain down the Torres until the whole ridge was bathed in crimson light. The glow on the Torres cast a hue on the milky green lagoon almost like a spotlight had been turned on deep below the water line. I was mesmerised by the show. 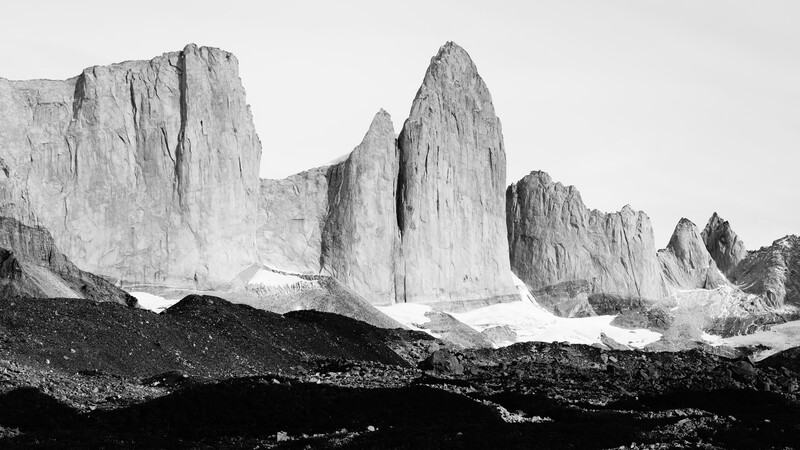 I stared endlessly at the towering rock, totally captivated with what I saw, taking. one photograph after another. It was truly a special end to the ‘W’ trek – even for me who is certainly not an early morning person. 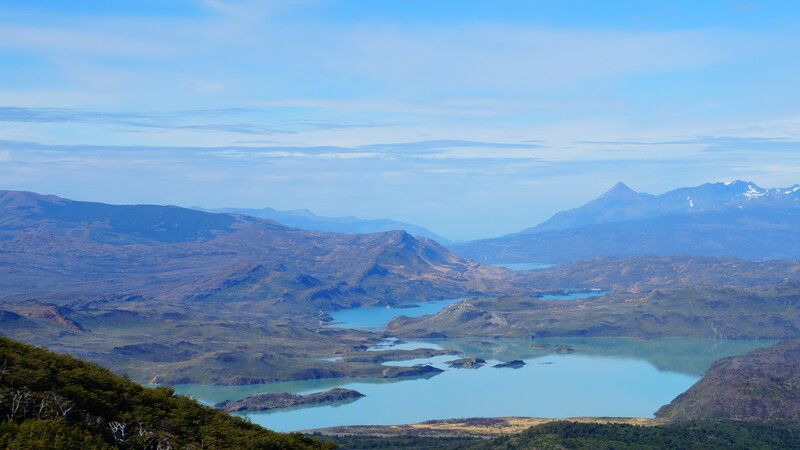 After my return to camp and dragging Dan out of his sleeping bag, we took a slow and steady walk back down to Hosteria Las Torres and onto Guarderia Laguna Amarga where the bus would collect us at 2.30pm. Our bodies were very weary and our trousers felt much looser than they did 5 days ago but we felt a huge sense of achievement and satisfaction from our trek. As we walked, we reflected on our 5 day adventure and agreed the park was truly beautiful and exceeded our expectations. At times during the trail, in particular the front section of the ‘W’, we wondered if the park was becoming a little too orderly and manicured with signposts insisting everyone keeps to the same tracks and rangers/volunteers beautifully maintaining paths, building briges over boggy ground and cutting back foliage. However, we came to the conclusion that all of this hard work is very neccessary to keep the natural environment intact with nearly 150,000 visitors every single year. Our camera was full of photographs with each panorama even more beautiful than the last. 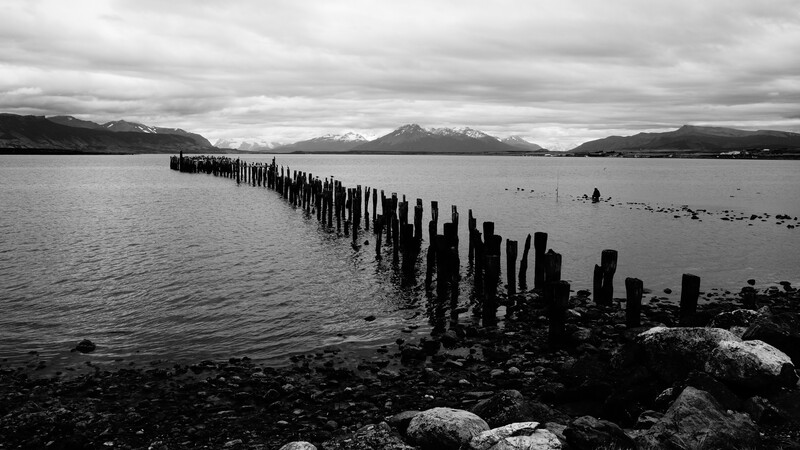 That evening in Puerto Natales we would dine like kings and raise a glass of Pisco Sour to our adventures in Torres del Paine and many more to come. ← Why didn’t they tell us that! Kate and Dan – really enjoying your blog. 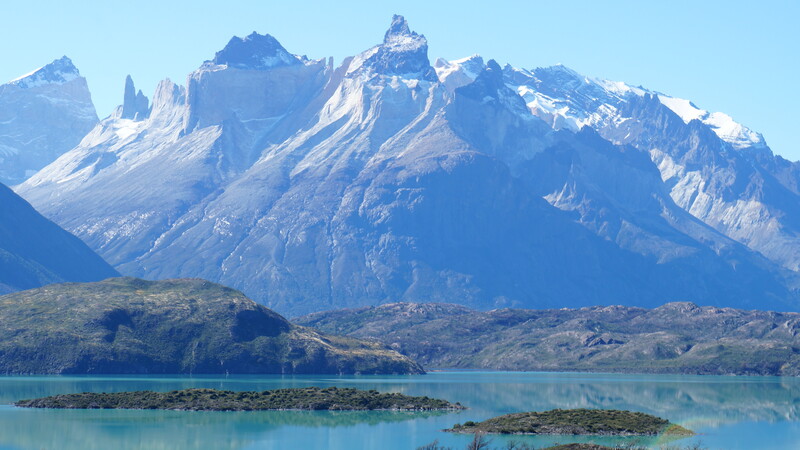 The Torres del Paine looked amazing! Unfortunately when we were there it was torrential rain which made for extremely difficult work and not so many great photos. Really nice to see what it should have looked like!! Keep up the good work with the blog. Looking forward to more instalments!